Depending upon how you define "highest mountain," Mount Everest has some rivals! Highest Altitude: An altitude of 8,850 meters (29,035 feet) above sea level makes Mount Everest the mountain on Earth with the highest altitude. "Highest altitude" means that it has the highest elevation above mean sea level. Almost everyone calls Mount Everest "the highest mountain in the world," and climbers from everywhere travel to Everest hoping to earn the distinction of climbing the "World's Highest." What does "world's highest" really mean? Mount Everest is called the world's highest mountain because it has the "highest elevation above sea level." We could also say that it has the "highest altitude." 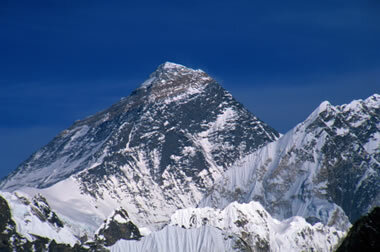 The peak of Mount Everest is 8,850 meters (29,035 feet) above sea level. No other mountain on Earth has a higher altitude. However, some mountains might be considered "taller" (with taller being "the total vertical distance between their base and their summit"). Everest from Gokyo Ri: A clear-sky view of the Mount Everest summit through a telephoto lens from the summit of Gokyo Ri. Image copyright iStockphoto / Grazyna Niedzieska. Tallest Mountain: The base of Mauna Kea is about 6000 meters below sea level, and the summit is about 4000 meters above sea level. The distance between the foot of the mountain and the summit is about 10,000 meters. This makes Mauna Kea the "tallest" mountain in the world. Snow in Hawaii? 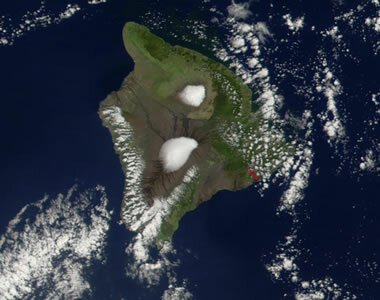 Satellite view of the island of Hawaii. The two snow caps are Mauna Loa (center) and Mauna Kea (to the north). Image by NASA. Mauna Kea has an altitude of 4,205 meters (13,796 feet) - much lower than Mount Everest. However, Mauna Kea is an island, and if the distance from the bottom of the nearby Pacific Ocean floor to the peak of the island is measured, then Mauna Kea is "taller" than Mount Everest. Mauna Kea is over 10,000 meters tall compared to 8,850 meters for Mount Everest - making it the "world's tallest mountain." 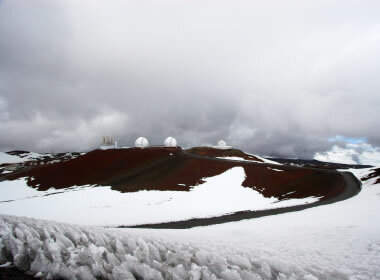 Astronomical Observatories on Mauna Kea: The summit of Mauna Kea holds other distinctions. In addition to being the summit of the world's "tallest" mountain, it is also the home of the world's largest astronomical observatory. At an elevation of nearly 14,000 feet above sea level, the observatory is above 40% of Earth's atmosphere. The atmosphere above the mountain is extremely dry and almost cloud-free. This makes it an ideal location for an observatory. And, yes, that is snow on the ground in Hawaii - the altitude is high enough and cold enough to accumulate snow. Photo copyright iStockphoto / GeorgeBurba. Highest Above Earth's Center: The Earth does not have the shape of a perfect sphere. Instead, its diameter is greatest near the equator. In the diagram above, the gray dashed line is a perfect circle, and the solid blue line represents the shape of the earth (exaggerated a bit to make its departure from spherical obvious). Chimborazo is located near the equator where Earth's diameter is greatest. This makes the summit of Chimborazo the highest point above the center of the Earth. Chimborazo in Ecuador has an altitude of 6,310 meters (20,703 feet). Mount Everest has a higher altitude, and Mauna Kea is "taller." 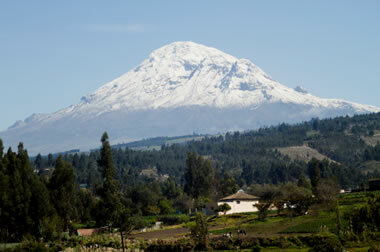 However, Chimborazo has the distinction of being the "highest mountain above Earth's center." This is because Earth is not a sphere - it is an oblate spheroid. As an oblate spheroid, Earth is widest at its equator. Chimborazo is just one degree south of the equator. At that location, it is 6,384 kilometers (3,967 miles) above Earth's center, or about 2 kilometers (about 1.2 miles) farther from Earth's center than Mount Everest. Snow at the Equator? Photo of Chimborazo mountain, Ecuador. Even though the mountain is very close to the equator, it is high enough to support a year-round snow cap. Image copyright iStockphoto / ache1978.